Two former presidents and the current Speaker of the House are putting party differences aside to help make sure some of the bravest heroes of the 9/11 attacks receive the tribute they deserve. Presidents Bill Clinton and George W. Bush are joining with Rep. John Boehner (R-Ohio) to head up an effort to raise $10 million to pay for the completion of a memorial for the victims of United Flight 93, which crashed into a field near Shanksville, Pa., at 500 mph. "It's wrong not to have that memorial finished," Clinton said in an interview with Yahoo! "This is something truly unique in all world history, as well as American history." All 40 passengers and crew aboard Flight 93 were killed on 9/11 after storming the hijacked Boeing 757's cockpit -- with one, Todd Beamer, famously declaring: "Let's roll." Through cell phone calls to people on the ground, passengers had learned that other hijacked planes had hit the World Trade Center towers and the Pentagon. It's believed the Flight 93 hijackers were planning to hit the White House or U.S. Capitol building. "I think it's important for future generations to understand what sacrifice and courage and dedication to our country means. 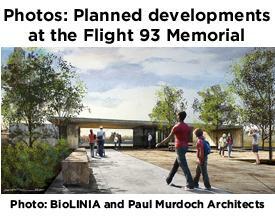 The Flight 93 memorial will send that clear signal for generations to come," Bush said, urging Yahoo! viewers to contribute to the project. And Boehner, also in an interview with Yahoo!, said, "What these citizens did was really heroism. They acted on their own, and they had been on the phones with their families, and they had an idea of what could happen and decided to sacrifice their own lives to save many others." Donors already have given $52 million to fund the $62 million memorial. "There has always been a special place in the common memory for people who deliberately, knowingly, certainly lay down their lives for other people to live," Clinton said at a dedication ceremony for the completed portion of the memorial, held Sept. 10 in Shanksville. He added that he was "aghast" to learn that more money was needed to complete the project, and said he and Boehner had decided earlier that day to do something about it. Bush, who joined in as soon as he learned of Clinton and Boehner's plan, also delivered remarks at the ceremony. "We have a duty to live our lives in a way that upholds the ideals for which these men and women gave their lives," President Bush said. "To build a living memorial to their courage and sacrifice." The memorial includes polished granite slabs bearing the names of the 40 victims. It also features an elongated walkway next to a circular field -- permanently restricted to family members -- where the jetliner slammed into the ground. When complete, it will cover 2,200 acres, and will include a memorial wall, a grove of 40 trees (one for each passenger or crew member who died), and, eventually, a 93-foot "tower of voices," comprising 40 wind chimes. Clinton and Bush have teamed up several times in the past to promote causes of national or international importance. In the aftermath of last year's massive earthquake in Haiti, they joined forces to lead a major fundraising effort aimed at helping to rebuild the country, which has raised more than $50 million. Clinton, Bush and Boehner are asking for your help in raising the $10 million still needed to complete construction of the memorial. Click here to donate today.